Common Earth Gardens is dedicated to the empowerment and improved quality of life of refugee families and Louisville communities through agricultural opportunities. The program bolsters mental and physical health, community integration, and access to healthy food and supplemental income. 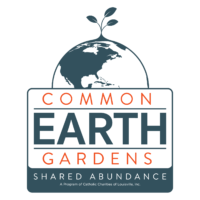 Common Earth Gardens supports self-reliance by facilitating access to land, culturally-appropriate training, community education, technical assistance, and opportunities for supplemental income in Louisville, KY. Utilize their extensive agricultural skills and experience to reduce food costs. Continue traditions from their homelands that will ease acculturation to the Louisville Metro area. Build entrepreneurial skills and supplement family income by selling produce through local outlets.